Michael Rusk is on a hot streak on his college basketball picks. Tennessee hasn't won an SEC Tournament title since 1979, while Auburn is looking for its first since 1985. One of those droughts is guaranteed to end at 1 p.m. ET on Sunday when the No. 3 seed Vols and No. 5 seed Tigers meet up in the 2019 SEC Tournament Championship Game in Nashville. The Vols, fresh off a dramatic win over Kentucky in the semifinals, are six-point favorites in the latest Tennessee vs. Auburn odds, up from an open of five. The over-under for total points scored is 145.5, down sharply from an open of 149.5. Before locking in any Tennessee vs. Auburn picks of your own, see the 2019 SEC Tournament predictions from SportsLine guru Michael Rusk. Rusk built his name by exploiting flaws in public betting. With his economics and statistics background, Rusk uses multiple algorithms pooling with recency bias to produce profitable picks. That's exactly what "The Prodigy" has been doing recently with his strong 28-16 run on his college basketball picks. Anyone who has followed him is way up. Now Rusk has zeroed in on Tennessee vs. Auburn and locked in a strong against the spread pick. You can only see it at SportsLine. Rusk has taken Tennessee's balance into account. The Vols are anchored by SEC Player of the Year Grant Williams, who averages 19.2 points and 7.6 rebounds per game. As good as he is, he's arguably not always the best player on the floor for Tennessee. That might be senior Admiral Schofield, a rising NBA prospect who has put up 41 total points thus far in the SEC Tournament. Point guard Jordan Bone has added 32 points and 14 rebounds through two games in Nashville. And guard Lamonte Turner came up huge late in the Vols' 82-78 win over Kentucky on Saturday, draining a 3-pointer in the closing minute that gave Tennessee the lead for good. Plus, with the game in Nashville, Rick Barnes' squad will be playing in front of a mostly partial Tennessee crowd at Bridgestone Arena. But just because the Vols had the better season overall doesn't mean they'll be able to cover the Tennessee vs. Auburn spread. Auburn, coached by former Tennessee head coach Bruce Pearl, knocked off the Vols in the regular-season finale, 84-80. That game put the Tigers in position to make the 2019 NCAA Tournament, and their strong run in Nashville that has included wins over Missouri, South Carolina and Florida has done nothing but help their seeding. Auburn enters Sunday on a seven-game winning streak and has won nine of its last 10. With an offense that averages about 80 points per game, the Tigers have shown they can compete with just about anybody. They nailed almost 40 percent of their 3-pointers in the recent win over Tennessee. We can tell you Rusk is leaning to the under, but his much stronger play is on the spread. He has identified a critical X-factor that causes one side of the spread to hit hard. He's only sharing what it is, and who to back, at SportsLine. Who wins Auburn vs. Tennessee? And which critical X-factor makes one side of the spread a must-back? 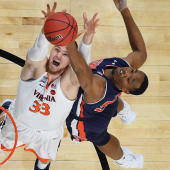 Visit SportsLine to see which side of the Auburn vs. Tennessee spread you should be all over, all from the expert crushing his recent college basketball picks, and find out.